At Doxly, we take a holistic approach to managing all legal transaction types and reducing time spent on low-value adding activities in the deal process. In our efforts to improve attorneys’ complex transactional workflows, we completed an in-depth time study of the closing process to analyze where time is consumed, where the largest opportunities for improvement are, and how we can introduce meaningful gains for law firms. We had two main objectives for the study: 1) determine which activities in signature management require the most time and therefore present the biggest opportunities for efficiency gains through redesign and automation, and 2) provide baseline information that enables contrast between the processes executed manually and conducted with automated support. Once we categorized the general activities, we conducted a time study to determine which activity requires the most time. For the study, we compiled a group of five individuals with different backgrounds and familiarity of the closing process but all were proficient in document editing. The exercise was conducted using a real venture capital transaction which required 23 documents and 30 signers (investors, board members, stockholders, and the company). 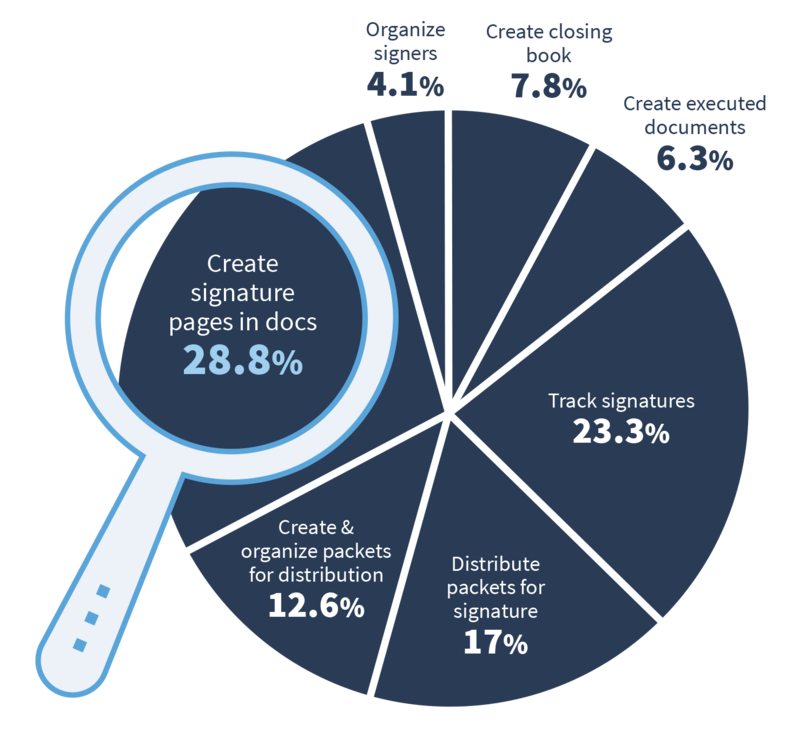 In the traditional process, practitioners typically open each document requiring signature from their document management system (DMS), create all signature pages for each document and save the updated document back to the DMS. In this instance, we allowed the individuals to skip the step of locating documents in a DMS which required less time than using traditional methods. The exercise did provide sample signature blocks in which all of the signers’ information was presented in one document rather than in separate emails. And the individuals were encouraged to use efficiency tools such as copy-and-paste features. The resulting time per signature block creation was 1.2 minutes with initial signature blocks taking 2-4 minutes and later ones taking less than a minute after re-use could be leveraged. The graph below shows the modeled manual time, in minutes, spent in each stage for the venture capital transaction. “Create Signature Pages in Documents” was the most time-consuming activity. Using manual processes, the percentage of time required to complete this process ranged from as low as 21% to as high as 31% of the total time, depending on deal size parameters. However, in all scenarios modeled, this stage was the single most time consuming with “Tracking Signatures” taking second place. The pie chart below shows the relative proportion of time by workflow stage for a relatively small or basic deal. We completed a second time study using the exact same venture capital transaction (23 documents and 30 signers), the same individuals, and the seven-stage work workflow. The only variable in this study is that the Doxly system (version 2.0) was used to provide automated support. With respect to the second objective, provide baseline information that enables contrast of manual and automated support, the model results suggests Doxly provides significant time savings overall. The analysis shows an overall time savings of nearly 80 percent. This is due in part to the fact that some stages are almost completely automated (e.g. “Create & Organize Packets for Distribution”). The graph below shows the modeled manual time, in minutes, spent in each stage relative to the time using Doxly. To validate the model results, the total time produced by the model was compared to information provided by customers and prospective customers on the signature management time on small, medium and larger transactions. The results have also been exposed to several Doxly and non-Doxly practitioners to obtain their feedback. The overwhelming majority of reviewers believe the results are directionally correct. Using this information the Doxly team was better able to understand which activities provide the most opportunity for automation improvement. Doxly subsequently released a redesign of the Signature Page Creation feature to further optimize this single most time-consuming step. Doxly’s product team continues to use the results to drive other improvement priorities.